Before going to talk about how to cut threads using the lathe, it is very important to know what a thread is? 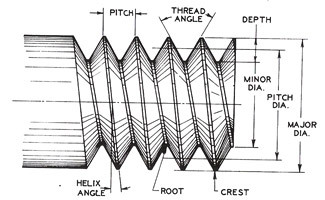 Thread in layman’s language is ‘a series of crest and trough’ or ‘a helical groove’ created along a cylindrical or conical surface. Technically, it is defined as helically shaped ridge having uniform cross-section wrapped around a cylinder or cone. A thread is generally classified as an external and an internal thread, sometimes also called as male and female threads. Threads are used as fasteners or as motion transmitter or convert rotary motion to linear motion, etc. As we became familiar with threads, let us talk about the lathe. A lathe is a machine which is used to shape wood, metal, etc. by removal of material. A lathe can perform various operations such as turning, knurling, facing, etc. In a lathe, a workpiece is being rotated along an axis of rotation and different machine tools are used to perform different operation on the workpiece. Pitch: It is defined as the distance between two points starting from one point on one thread to another point at a similar location on the consecutive thread, measured parallel to the axis of the cylinder. Lead: It is the distance moved by a thread in an axial direction on one complete revolution. Major Diameter: It is the largest diameter of the thread measured from one crest to the other crest in opposite direction. Minor Diameter: It is the smallest diameter of the thread measured from one root (trough) to another root in opposite direction. Threads per inch (tpi): As the name suggests it is the number of threads in an inch. It is being measured by placing scale alongside the thread and counting no. of pitches. Depth: The distance measured between a crest and a root in the perpendicular direction to the axis of the cylinder. First of all, machine the work piece up to the major diameter of the thread which has to be cut using the turning center. Now the work piece is set up in the chuck for threading between the centers. The chuck is connected to the spindle which is being geared with the lead screw. To have proper speed ratio between the spindle and lead screw a quick change gearbox is used. So, set the quick change gearbox according to the required pitch of the thread. Set the tool bit at the right angle with work piece using thread gauge. Now moving the threading tool bit towards the work piece using compound and cross feed. Micrometer of both feeds should be set up as zero. The carriage is being moved to a predetermined distance per revolution of the job due to the rotation of the lead screw. This done by positioning the carriage’s half nut to get engaged with the lead screw. The half nut or split nut must be engaged at an exact predetermined time for proper cutting of successive cuts. This is done by the use of thread chasing dial or graduated dial. This dial is being attached to the carriage and is being driven by worm gear attached to lead screw. This step is known as tracking of thread tool. The face of the graduated dial is divided into an even number of full and half divisions. If the split nut is not engaged and the lead screw is rotated, then the thread dial is also rotated. Now if the number of the thread had to be cut is even in numbers then split nut should have engaged, when any line on thread dial coincides with zero line and when an odd number of threads had to be cut then any numbered line should coincide with the zero line. Take a scratch cut at the component without lubricant. Disengage the half nut on the verge of the cut, stop the lathe and back out the tool by the usage of the cross feed. Return the carriage to the beginning point. Now check the thread pitch using screw pitch gauge. If it’s correct then proceed to next step. Feed the compound in 0.20 to 0.50 mm for the primary bypass with the use of cutting oil. As you get close to the final pass, reduce the depth of cut to .025 to .075 mm. The process is continued or successive cuts are continued until the thread comes closer to the desired depth or within .025 mm of final depth. Then final pass of cut is given at the depth of cut .025-.075 mm. After finishing all this chamfer the end of the thread to avoid damage to the thread. The work piece is fed inward either radially or swivelling the compound rest. To cut left hand threads move the tool from left to right and for cutting the right hand thread, the tool is moved from right to left. ← What is Heat Treatment Processes?